While I mightn’t understand Auckland’s need for speed to build a party zone for rugby boys; rue the day that some idiot coined the phrase Super-City; and may make a mockery of the glacial speed of traffic up there from time to time: they do have one thing coming on stream in AKL that will leave Welltown for dead. Yes, at long last the memorial to Sir Peter Blake is nearing completion – from the outside at least – and the building is looking gorgeous. The “Blue Water Black Magic – Tribute to Sir Peter Blake” experience is due to open to the public in Auckland in mid-December. 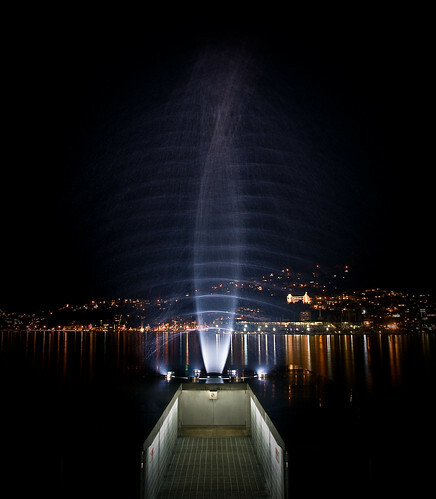 And it’s looking gorgeous so far, as it glitters across the water in it’s lighting trial. The external facade is a diaphanous facade of gently hued polycarbonate glazing, situated down on the waterfront near the maritime museum. 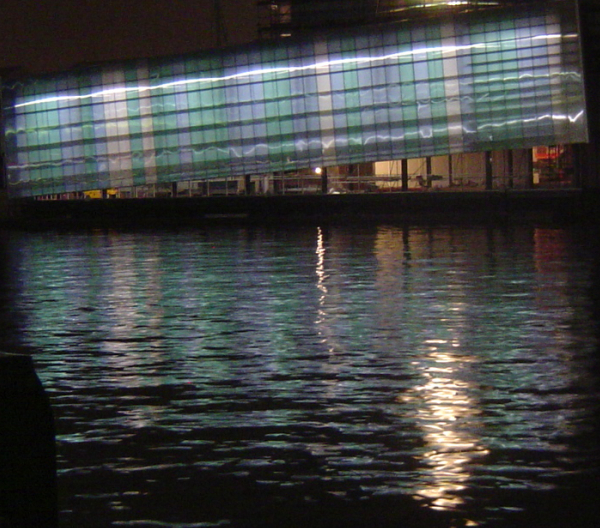 Composed of the humble yet versatile plastic Danpalon (as used to such charming effect by Herzog de Meuron at the Laban Dance theatre in London a few years ago), the back-lit coloured box is just going to ripple seductively across the water. Luckily we snapped a peek when they were doing their light trial – before the sacred boat makes it into its home. Inside of course is a yacht (NZL 32), seeing as Auckland is such a watery affair and Sir Peter was the keystone in the NZ America’s Cup challenge. The team involved won some silverware, once or twice, in a game that has long since lost its lustre, now being batted back and forth in a match of lawyers that we can no longer afford to take part in. We’ll probably never win the cup again – the financial cost is too high. But we like the building. And we love the boat. We look forward to further progress. Might even be worth taking a special trip up there, just for that one building, when it opens. Certainly, for once, there may be a decent reason to go to the otherwise dreary waterfront in Auckland. Bravo Auckland – and well done to Pete Bossley and the team from the New Zealand Maritime Museum. Meanwhile, of course, we have a Water Whirler. Very nice. Very state-of-the-art. Very small by comparison. I STILL haven’t seen the water whirler whirling. But I did walk past there on Saturday and there was a seal sitting on the rocks nearby. Never seen one inside the harbour before. You’re lucky to see a seal – there must only be a few nesting around the harbour, as they tend to avoid our pollution. Mind you, there are also some penguins nesting near the Water Whirler at times – you can hear them at night as they discuss the days news over regurgitated fish dinner.